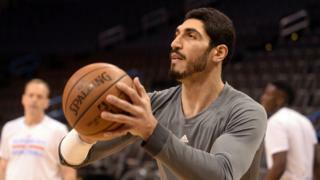 An NBA basketball player from Turkey, Enes Kanter, has been stopped at a Romanian airport, after Turkey cancelled his passport. Kanter, an Oklahoma City Thunder star, posted a video on Twitter saying this was due to his political views. He blamed Turkish President Recep Tayyip Erdogan, who he called "a bad, bad man", and a "dictator". Kanter, who turned 25 on Saturday, was later allowed to fly to London. It is unclear what documents he was using. "They've been holding us here for hours," Kanter said in his video. "The reason behind it is, of course, my political views." He posted a similar message in Turkish. Romanian border police confirmed facts related to Mr Kanter's story, but did not speculate over the reasons. In a statement - accompanied on social media by a photo of the sports star with police - border officials said he was detained at around 13:00 (12:00 GMT) after arriving on a plane from Frankfurt. His passport was not valid, having been cancelled by "the issuing state", it said, and they could not allow him to enter Romania. But he was not under arrest. He left at around 17:00 on a flight bound for London, it said. When mentioning President Erdogan, Kanter told his audience: "You guys know him by, you know, he has attacked the people in Washington." 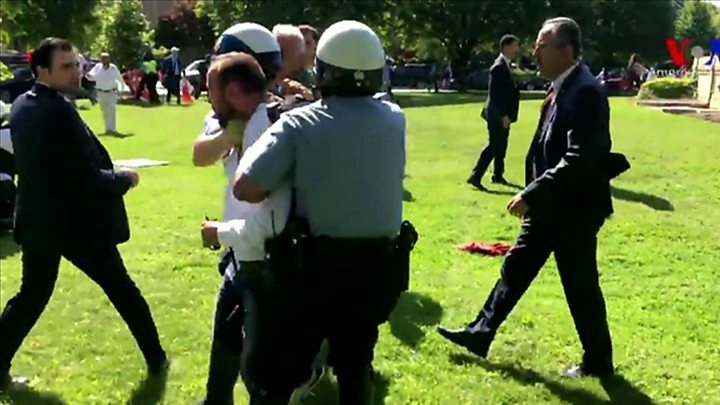 He was referring to a controversial clash between protesters and men apparently linked to Mr Erdogan's security detail during the Turkish leader's recent trip to the US. Kanter is a supporter of Fethullah Gulen, the US-based cleric blamed by the Turkish president for inciting a failed coup in 2016. What is Turkey's Gulen movement? Turkey has demanded the preacher, who runs a network of schools in Turkey, be extradited, but the US has said it will only do on the basis of evidence. In August 2016, Kanter cut ties with his family after his father publicly disowned him in the Turkish press. Since the failed coup, suspected Gulenist supporters have been purged from jobs in Turkey. Many have been arrested.